It’s a familiar sight at this time of year: Long line–ups in front of every movie theater, major Hollywood stars at every turn, and hundreds of reporters trying to get the scoop on the films that are destined to become both critical and commercial successes over the next year. It’s a familiar sight, IF you live in Toronto. If you live in Vancouver, you get VIFF. VIFF is exactly like Toronto’s film festival, except that it screens films you’ve never heard of, no stars ever come to it, and nobody ever goes to the movies. I would say that the Vancouver International Film Festival is like a poor man’s version of Toronto’s festival, but that would be insulting to poor people. That being said, VIFF is not without it’s considerable charms. There are a LOT of great movies that get screened at VIFF every year. It’s just that many of them are so far under the radar that it takes a lot of extra work to discover them. And because the fabulous organizers of VIFF want you to go to every movie, they pepper their guidebook with such phrases as “revelatory and revolutionary cinema experience” and “hallucinatory homage to the early works of Truffaut and Bunuel”, which makes you think you’re going to see something so great that it could only be a cross between Godfather and The Matrix, when it reality it’s only a documentary about the indigenous black squirrel population on Sechelt Island. I kid because I love. I love the breadth and depth of movies that are shown at VIFF, and I’m going to be seeing quite a few of them this year. I’ll be updating this site every few days with my reviews. Unlike many of the films at VIFF, Like Crazy is one that you will most likely be able to see in a mainstream theatre soon, at least for a little while. And if you get that chance, you absolutely need to take it, as I doubt you’ll see a better love story at the theatre this year. 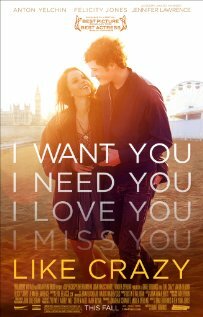 It’s about Jacob and Anna, two kids who fall in love just as they are finishing school. They are both young, both beautiful, and both talented. Blah. The only snag on their way to becoming the annoying perfect couple that you hate having to your house for dinner parties, is that Anna lives in England, and that Jacob lives in California. It seems like a minor problem for two people who are serious about being together to have, and at first, it is. But eventually the distance becomes so great, and so all-encompassing, that it causes what was an epic love story to become burdened with that evil killer of mythic relationships: reality. Like Crazy is a wonderful film, in pretty much every way. It’s script is so realistic, and so effortless, that it feels not so much like a script as it does a Google Doc, that is constantly being updated by the cast. And in fact it’s not surprising to find that many lines of dialogue were actually improvised by the excellent cast. In Anna and Jacob, Anthon Yelchin (Chekov in JJ Abram’s recent Star Trek update), and Felicity Jones, have created one of the most charming, likeable, and heartbreaking couples you’ll see in a modern movie. If you like your love stories monumental, but doused with a minor dose of reality, this movie is for you. In some ways Tyrannosaur feels like a perfect companion piece to Bennett Miller’s recent crowd pleaser, Moneyball. 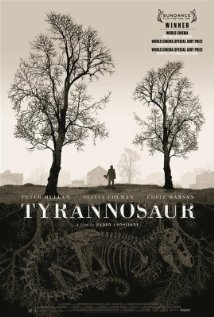 If Moneyball is about resistance to inevitable change, Tyrannosaur is about the embrace of such change. It’s about Joseph (played by Peter Mullan, in a role that basically ensures him of a career playing nasty mob bosses for the rest of his life), and Hannah (played by Olivia Colman, who will most likely be recognized by North American audiences for her role in Hot Fuzz), two characters so utterly miserable in their own horrible lives, that they gravitate towards each other, like two black holes of sadness. While that may not sound appealing, it’s not as gloomy as it seems. Both characters seem to be at least somewhat aware that their misery can be overcome, and that they actually hold the key to happiness in their own hands. And so both characters begin the slow, painful, steps towards change. It’s messy, it’s hard, and we know that there are still going to be struggles for both characters long after the movie is done. But there is still optimism here. Paddy Considine never makes us believe that his characters are beyond redemption, and in fact has given each of them a huge lifeline that almost guarantees further happiness: Each other. This entry was posted in Movies and tagged Movies, VIFF. Bookmark the permalink.